I am a huge Southwest Airlines fan, and that is probably because I am also a big fan of their Rapid Rewards program. I use a Southwest Rapid Rewards credit card for all of my business expenses. I pay it off every month (religiously). I also use it to book my flights with Southwest since I travel them often, which also earns me additional rewards. 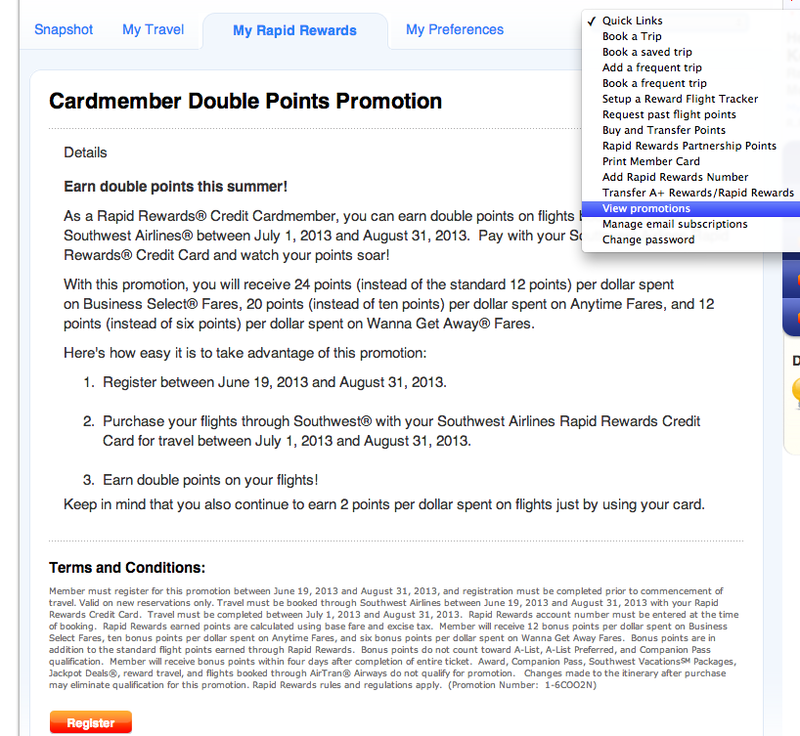 Right now, they have an awesome promotion going on in which Southwest Rewards Credit Card members can earn DOUBLE points between July 1st, 2013 and August 31, 2013 which is awesome because that means the potential for FREE travel if you will be doing any flying during this time period! All you have to do to claim this promotion, is to turn it on in your account by going to your Rapid Rewards page, and searching promotions (they actually list quite a few, so I check them often in case they have any that I qualify for) Once you register, it’s turned on in your account, whether you actually end up traveling or not. I was pretty excited about this as we actually have a family trip to Florida during this time period which will mean a big bonus of rewards…PLUS if I pay for our flights with my card, I will earn an additional 2 points per $1 that I spend on flights! *UPDATE! We had a wonderful time on our trip to Florida (you can read more about that here) and I am so excited at how many bonus points that I earned in my account for taking advantage of their double rewards promotion!